Looking to use up some leftover oat bran, I searched the VT website for something that I knew would either be breakfast related or "meat" related. 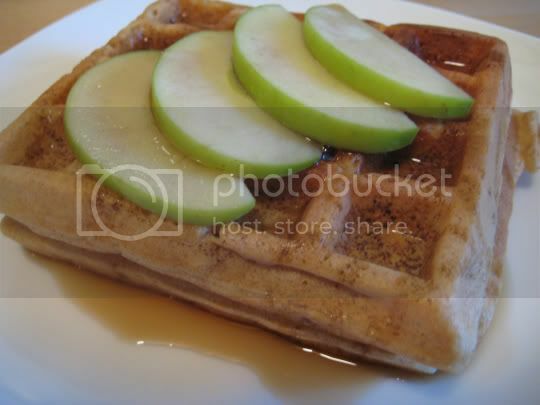 Behold...yummy oatmeal apple waffles. The oat bran and rolled oats made these chewy and hearty. They were sturdy enough to make one of those waffle-sandwich things, maybe with some cream cheese and diced fruit, mmmm. The cinnamon is strong here, but just strong enough to pair well with its favorite fruit, the apple. My only gripe with these waffles is that they are probably best eaten the same day. I stored the remaining waffles in the fridge overnight with the intentions of heating them up for the next day's breakfast...which I did, and the flavor was still there, but they were a little dry and bread-y. Make again? Yes, for a crowd, and with whip cream.